~ Fredric Jameson, An American Utopia: Dual Power and the Universal Army. ~ Fredric Jameson, Future City, New Left Review 21, May-June 2003. ~ Slavoj Žižek, The Spectre of Ideology, in Mapping Ideology. ~ Nick Land, Interview with Delphi Carstens. Now I would like to come to the point and talk about the ways and means of fixing the future today. My aim is to provide new strategies in the way of altering the grim future awaiting us so often portrayed by dystopian imagination. The end of the world scenarios dominating the science-fiction scene presuppose a predestined future towards which we are heading. Dystopias are warnings from an imagined miserable future with the intention of casting a critical gaze upon the present. Counter to this, utopian thought and imagination project a future in which the dystopian negativity has been overcome. In a sense utopia is the transcendence of dystopian conditions. I claim that it is possible to change the past and the future alike by way of reconstructing utopian and dystopian thought and imagination in terms of their relation to time and temporality. Any change of the past effectuates change in the present and the future alike. Although neither the present nor the future can be determined, a view of the present from the stance of an alternately imagined, less bad, or even better future enables us to write a future history of the present, or simply a history of a future which doesn’t yet exist outside the virtual domain of imagination, or conception for that matter. Of course we cannot change the past as it really occurred, but this doesn’t mean that we cannot change its effects on the present and the future. It is often said that the past and the future are qualitatively the same. But there is something questionable in the here assumed identity of the past and the future. Although they are both inaccessible in terms of their unknown status, this doesn’t necessarily mean that they embody exactly the same qualities. There is a discrepancy in the qualities constitutive of their diverse virtualities. To put it in Kantian terms, we have here two different modes of time in-itself, these are the past and the future. While we know some things about what happened in the past, we know nothing of what will happen in the future. Our knowledge of the past is not in-itself but partial, we draw the rest of the picture according to a desired future we have in mind. Here we have a desired future as an idea which shapes the past itself. Utopian tradition dates back to Plato’s Republic, although the term was coined by Thomas More back in 1516. 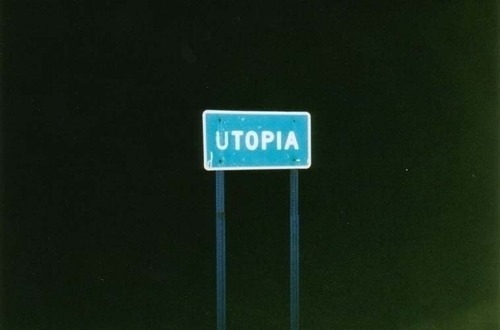 Utopia: No-Place and Good Place > signifies progress in time. Dystopia: Bad Place > signifies regress in time. Utopian strategies have a positive and programmatic element while dystopian outlooks have a negative and diagnostic element. The imaginary utopian construct presents an ideal mode of being in contrast to the already existing, imperfect model of society. Utopias have often been criticized for being unrealistic and fantasmatic constructs detached from reality. The association of utopia with a dreamlike, illusory state of being derives from its interpretation as an impossible world in stark opposition to the laws of nature. The bad reputation of utopias owes much to their distance from actuality. Almost every utopian text, regardless of its time and place, imagines a world in which everything is perfect. But everything cannot be perfect in reality, that’s the dilemma. Dystopia emerges upon the realization of this impossibility. If utopia designates a new possibility, dystopia registers an impossibility. This scenario can of course be read reversely as well. The aim of utopia as method is to show us that the world in which we live is absolutely contingent, that the things don’t have to be the way they are. The possibility of change is always imminent. Now, we know that a common trait among the utopian texts is that they mostly suspend the laws of nature. What we consider to be normal according to the laws of nature are not what they appear to be, since the so called laws of nature are themselves constructs. This theme of radical contingency has been worked through by Quentin Meillassoux in his After Finitude. But in a more recent publication, SF and Extro-SF, Meillassoux delivers a more relevant rendering of radical contingency as far as Utopian studies is concerned. In this book Meillassoux puts forward the idea that SF should become Extro-SF and create worlds where science fails. Meillassoux claims that Extro-SF takes place in a non-world where our scientifically approved laws of nature simply don’t work. Some Utopias are attempts at changing the transcendental of a world more than changing the rules within a given game. One of the issues most utopian studies don’t address is the question of “how do we get from here to there?” Utopias almost always designate a completely different organization of society without contemplating how this idealized society can be actualized. It is not difficult to prescribe what kind of society we ought to live in for the betterment of human condition. What’s difficult is to map-out the process of actualizing this utopian idea. The issue at stake here is becoming capable of looking at the past and the present from the perspective of the future. Needless to say this future from which we ought to look at the past and the present is an imagined future, a future vision and a vision of the future at the same time. Sensient and sapient, rationality and sensibility, out of the conflict between these two arises a counter-productive alienation. This counter-productivity is not an anti-productivity, rather than being against productivity, it is a productivity which begins from a different time if not from space. If there is a synonym of alienation it is sapience. Being sapient is to be alienated from something. That thing is unknown, it is itself a projection of an imaginary construct of that which is onto that which is not. The dialectical process driving the utopian method is a movement against madness and death. In its proper sense it manifests a principle of survival in the face of loss, rupture, and trauma. The will to life manifest at the core of dialectical process as utopian method moves from a bad past and an even worse present towards a less bad present and perhaps an even better future. The future arises out of the interruption that separates the past and the present. It is the shape the subject gives to this void in time that matters. Let us recall Freud’s designation of the unconscious as that which is timeless and indifferent to difference, just as an immortal among the mortals would be… Freud’s conception of the unconscious obviously resembles Kant’s concept of the noumenon, the thing-in-itself which lies beyond the phenomenal realm within human access. The Real is not substantial, it is rather this void in reality which sets time in its course. It is not for nothing that from Descartes to Lacan and Badiou the subject is a formal entity which stands in for the void in reality. The Real is not exactly the Kantian noumenal but its situation in time. It is here that Lacan’s contribution to Freud’s metapsychology is inscribed. In a sense Lacan does to Freud what Hegel had done to Kant. Lacan and Hegel situate the Freudian and Kantian subjects in time as voids in reality itself. The Real as the void in reality and the subject as void in time converge with the Cartesian cogito, the Kantian subject, and the Freudian unconscious. It is only with Hegel and Lacan via Zizek and Badiou that we recognize this convergence. “Messianic time” ultimately stands for the intrusion of subjectivity irreducible to the “objective” historical process, which means that things can take a messianic turn, time can become “dense,” at any point. The time of the Event is not another time beyond and above the “normal” historical time, but a kind of inner loop within this time. Thinking from beyond the supposedly predestined future doesn’t signify a stance from which a predetermined future is projected onto time. Such an act, without its inverse operation simultaneously at work to prevent a possible catastrophe, would put us in a position similar to that of Oedipus and his father, who, in escape from the prophecy, both fall victim to the very prophecy they were trying to escape from. Thinking from beyond the supposedly predestined future also requires figuring out how we should act now in accordance with what we don’t want the future to be like and think in such a way as to create the conditions of impossibility for this unwanted future to take place while we construct a new vision of the future. This procedure of thought explicates the signs of what the future will be like if things go on the way they are, and then points out “what is to be done, what can be done, and how it can be done?” at present in accordance with the non-being of that dreaded future so as to render it impossible to become now as time goes by. Some readers may or may not object to this procedure for being driven by a fear of what might happen. To those readers all we can say is that there are rational fears and there are irrational fears. While rational fears help secure a new and less bad future for us, the irrational fears usually destroy the possibility of even a less bad future let alone create a better one. For those who have eyes to see and minds to perceive the signs from the future are always already there, here and now. At stake here is a matter of coming from the future and intervening in the present with what is at hand, both to prevent the worse future and to create a less bad one. Paradoxical though as it is, this process requires a simultaneous coming from a reconstructed past and an imagined vision of the future, coming from the past and the future at the same time, moving towards a not yet existent space-time, an utopia, that place which is not. It is a non-place, a time without space, it comes from a slice of time wherein time itself is not “the number of motion with respect to past and present,” as Aristotle claimed it is in his Physics. In our world the measure of movement is not the measure of time. Kant had already pointed out that time is “inner sense” and space is “outer sense.” Understanding time and space as forms of intuition and sensibility renders it possible for Kant to posit his presuppositions as synthetic a priori categories of understanding. Deleuze synthesizes and employs Bergson and Kant to develop his concept of “impersonal consciousness.” The dissolution of the one coincides with the emergence of a plurality of sense. Transcendental empiricism is precisely the attempt to give a voice to the many. The univocity of being is Deleuze’s name for the death drive which in-differen/t/ciates, that is, disjunctively synthesizes, an operation which unites as it splits, causing indifference and non-difference at the same time. Indifference has two aspects: the undifferentiated abyss, the black nothingness, the indeterminate animal in which everything is dissolved –but also the white nothingness, the once more calm surface upon which float unconnected determinations like scattered members: a head without a neck, an arm without a shoulder, eyes without brows. The indeterminate is completely indifferent, but such floating determinations are no less indifferent to each other. If there is a movement of thought which has stamped the significance of dialectics and as well as the meaning of utopia upon contemporary climate of theory and made this significance manifest for the present state of political affairs in the world, it can be found in Fredric Jameson’s books. It’s all a matter of knowing what to do with time, and Jameson knows what to do with it to say the least. In his remarkable book entitled Valences of the Dialectic, which is itself a performance of dialectical thought employing utopia as a method in action, Jameson takes it upon himself to point out the increasing relevance of the utopian thought and imagination in relation to temporality. Using Paul Ricoeur’s Time and Narrative as well as Aristotle’s Poetics in conjunction with the Hegelian system of thought driven by and driving the dialectical process, Jameson constructs a temporal narrative of how time and history are made to appear in the sixth and final part of his book devoted to The Valences of History. By way of introducing an epistemological difference beyond the ontological difference between ecstatic and enstatic conceptualisations of ontic time, Jameson also achieves positing a new difference between time and temporality themselves. History now requires a subject to make it appear anew and thereby become the cause of a new future. As a philosophical enterprise, Valences of the Dialectic, and especially its final part The Valences of History, signify a difference from Heidegger in understanding the transcendence and the transcendent, noesis and noema. This difference is the difference of Hegel’s dialectical process of infinity from Heidegger’s ontological horizon of possibility. The “transcending towards” of Heidegger is situated in a dialectical relation with Hegel’s identity of immanence and transcendence. 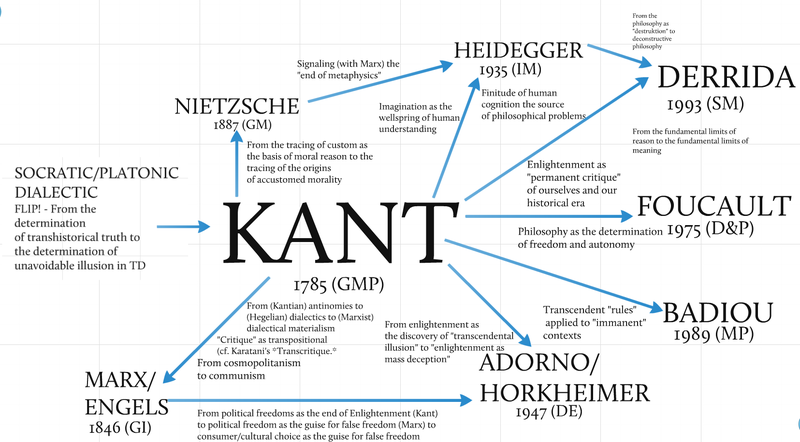 Now, if we keep in mind that Hegel is the philosopher of infinity and Heidegger the philosopher of finitude, we can understand why Kant has come to be playing the role of vanishing mediator between the two. The dialectical mode of thinking embodied by the Kantian edifice establishes a triplicity, a triadic structure in motion, which is constitutive of Kant’s position according to which time is the synthetic a priori par excellence. It exists before the subject is embodied by it, but this embodiment itself is the only way in which time becomes constitutive of the finite subject as driven by the idea of infinity. Kant calls this idea of infinity “the noumenal” which we can think but cannot know. The noumenal is precisely the regulative idea which is constituted by the subject in such a way as to situate itself as external to it. In this scenario, reason reaches the edge of madness and recoils in anxiety in the face of the actual existence of infinity. What Hegel does is to explicate the way in which infinity as an external obstacle becomes an internal possibility. By way of situating infinitude within finitude itself and inversely, Hegel shows that Kant’s attempt at overcoming the split between the subject and object is unnecessary since that split is internal to both the subject and the object rather than being between them. For Hegel the split is not between something and something else but rather within something itself. The void is internalized and nothing is situated within something itself. Nothing still remains but only as the void within that which is. Cosmologically speaking, life is the effect of a catastrophe in the universe. Perhaps life is this catastrophe itself, especially as far as human life is concerned. At some point in time something went horribly wrong and the Earth was born. But things didn’t stop there and kept getting worse. One catastrophe followed another and Life emerged. Will we ever know what exactly has caused the emergence of the organic out of the inorganic and inversely? We reckon there was not a single cause of this event but rather many. Each of these micro-causes instantly juxtaposed, merged into one another at a certain moment in time and gave birth to a macro-cause, the event itself. Following Heidegger’s proclamation that “the dreadful has already happened, and only a god can save us now,” as well as Deleuze’s well known quote from Bosquet which goes as “my wound existed before me, I was born to embody it,” it is still increasingly fashionable today to say that “the catastrophe has already occurred.” Yes, it did indeed, many times during the course of history as a matter of fact. And yet the question still remains: “what if there is not just one big catastrophe in the past alone, but many catastrophes happening all the time?” Yes, many catastrophes have already occurred, are still occurring, and will keep doing so in the future to come. There is no guarantee that the worst is over yet, or that there is no worse to come. As the poets would put it, “when we fall we fall hard, the troubles don’t singly come.” Perhaps we haven’t seen anything yet, and the catastrophe which is claimed to have already occurred is nothing but the beginning of a new sequence of catastrophes. Considering we are floating in a sea of catastrophes, it would surely be convenient to say that the best way of handling our catastrophic situation is to employ dialectics of time in the service of overcoming, reversing, or at least slowing down the worsening. The initial question to be asked in the way of achieving a transcendental approach to the concept of catastrophe is simply this: “what if the catastrophe occurred to prevent an even bigger catastrophe?” This question immediately empowers one who wishes to reconfigure the significance of a catastrophic event within a broader sequence of events. One therefore has to think and imagine what would have happened if the catastrophe had not occurred in its time. Now, of course this operation requires a writing of that which is not known in such a way as to effectuate a less bad future. It’s all a matter of minimizing the effects of the presumed major catastrophe which is itself the outcome of many minor catastrophes leading to that unfortunate sequence of events the consequences of which are yet to be determined. The best way of carrying out this minimization is to make up an alternative sequence of events in the past which would change the meaning of the present itself, thereby causing a new future to emerge. In this case the past and the future appear to be qualitatively identical in the sense that they are both unknown. We know neither what exactly has happened in the past nor what will happen in the future for sure. We are at a perpetual present whose presence itself is dubious in that it never really is, since as soon as we say “I am in the present now” the present which we say we are in becomes past. At this point we may either opt for constructing a fictional past in such a way as to slow down worsening, or disregarding the past altogether and focusing on the effects of the unknown past manifest in the present. At hand there are pieces of information concerning our situation as well as some sense-data such as mental and physical pain, a mass of misery which we have to put in the service of a less bad future than the one awaiting us if either nothing or something wrong is done. It is here that Lacan’s definition of the Real as “the impasse of formalization” becomes relevant, for it is there that the Real appears as its own disappearance, and hence as a void-in-process in the symbolic order. The imaginary enters the scene to fill in this gap opened by the forever vanishing objective dimension within the subjective process itself. For Badiou it is precisely at this point of impossibility of knowing that the Real emerges as the eternity in time which goes beyond mere subjective experience and objective reality alike. In a paper on Jameson’s Making History Appear presented at a conference entitled Thinking About Time: Temporalities of Capitalism and the Time of Revolution, Brassier touches upon this same issue of the problematic relation between formalisation, the Real, and making the impossible possible. Following Badiou’s footsteps in the field of formalism, Brassier asserts that a forcing of transformation in the structure of formalisation itself is required to go beyond the impasse of capitalist mode of production under which the subject itself is subsumed. Referring to Jameson’s definition of capitalism as “totalization-in-process” rather than an all-encompassing structure, Brassier points out that “time is what propels capital and drives capitalism on.” Since “capital configures the way in which time is experienced”, it is up to the subject to formalize a new time for itself in such a way as to reconfigure the subject of capital’s relation to time, and hence cause a transformation in the structure of capitalism itself. Here again it’s all a matter of turning catastrophe into a positive investment in the future. Quoting Jameson at length, Brassier underlines the role of catastrophe in the process of progressive transformations of the existing social and political world of history. In the phenomenon that interests us here, the sudden flash of a sense of history, we must somehow account for the evidence that History in that sense can be experienced either as nightmare or as a sudden opening and possibility that is lived in enthusiasm. It is an alternation which suggests the existence of some deeper duality in the thing itself: the way in which, for example, the appearing of History, its phainesthai, entails a new opening up of past and future alike, which can conceivably be marked antithetically: a somber past of violence and slaughter giving way to a new sense of collective production, or on the contrary a glimpse of promise in the past which is shut down by a closing of horizons in universal catastrophe. Better still, both these dimensions can be experienced at one and the same time, in an undecidable situation in which the reemergence of History is unrelated to its content and dependent above all on that form in which after a long reduction to the lowered visibility of the present, past and future once again open up in the full transparency of their distances. This returns us to the issue of the causes and effects of unfortunate incidents, those banal accidents of life which may have varying degrees of traumatic consequences. Related to this issue are the concepts such as causality, contingency, and necessity. Is it possible to know the absolute cause of an event? How are we to know whether an event was contingent or necessary? One should thus invert the existentialist commonplace according to which, when we are engaged in a present historical process, we perceive it as full of possibilities, and ourselves as agents free to choose among them; while, to a retrospective view, the same process appears as fully determined and necessary, with no room for alternatives: on the contrary, it is the engaged agents who perceive themselves as caught in a Destiny, merely reacting to it, while, retrospectively, from the standpoint of later observation, we can discern alternatives in the past, possibilities of events taking a different path. (And is not the attitude of Predestination—the fact that the theology of predestination legitimized the frantic activity of capitalism— the ultimate confirmation of this paradox?) This is how Dupuy suggests that we should confront the catastrophe: we should first perceive it as our fate, as unavoidable, and then, projecting ourselves into it, adopting its standpoint, we should retroactively insert into its past (the past of the future) counterfactual possibilities (“If we had done such and such a thing, the catastrophe we are in now would not have happened!”) upon which we then act today. What went wrong might in fact turn out to be the turning point in the course of happenings which sets things in the right course. Perhaps it was all already going wrong for quite a while now, and what seemed to be a negativity in this process of wrongoing was actually a contingent necessity for the conditions of rightgoing. The initial question the subject asks to itself in the face of aggravating situations of loss should better be this if the subject wishes to overcome the anguish it feels in the face of loss, and with sufficient effort even sublate its state of being in agony perhaps: “what have I gained with this apparent loss?” This question aims at initiating a thought process which would actualize a change at the level of perception. Now, which one is the next question, then? Why is there nothing rather than something? It would be best, perhaps, to think of an alternate world—better to say the alternate world, our alternate world—as one contiguous with ours but without any connection or access to it. Then, from time to time, like a diseased eyeball in which disturbing flashes of light are perceived or like those baroque sunbursts in which rays from another world suddenly break into this one, we are reminded that Utopia exists and that other systems, other spaces, are still possible. What we need today are many views from a timeless nowhere, from beyond a supposedly predestined future which doesn’t yet exist and may never do so, from the realm of a non-temporal Utopia, a nowhen, an uchronia perhaps. This utopic/uchronic event of looking at life on earth at present from an imagined and conceptualised future can turn out to be the spark of an open ended story the significance of which is never fully determined. As a method of viewing ourselves from nowhere and nowhen, this utopian/uchronian thought and imagination makes it possible to situate infinity as a void in time, a gap between the past and the present out of which a new future emerges. Beginning with this void in time, this nothing which is now at hand, the subject can become an active constituent of time rather than being passively constituted by it. 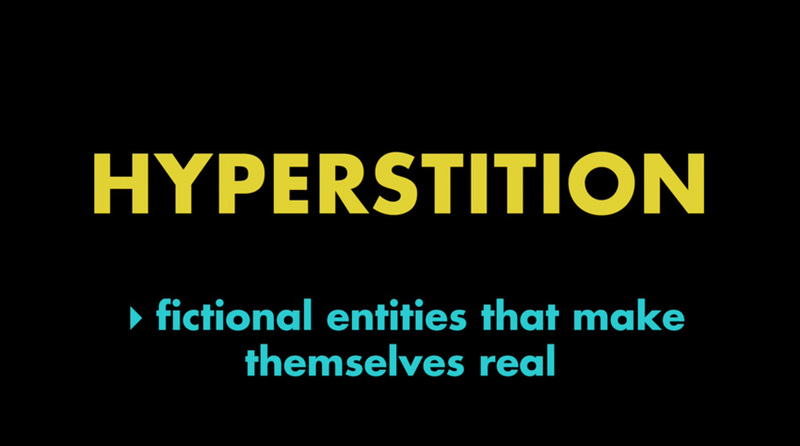 Hyperstitions are nothing if not the actualisations of this dream beyond the mythos and the logos of the predominant co-ordinates determining that which is possible and that which is not. Slavoj Zizek, The Puppet and the Dwarf: The Perverse Core of Christianity, (Cambridge and London: MIT:, 2003), p. 134-5. Gilles Deleuze, Difference and Repetition, trans. Paul Patton (New York: Columbia University Press, 1994), p. 36. Brassier, Nihil Unbound, p. 158. Ray Brassier, Jameson on Making History Appear, Thinking About Time Conference, American University of Beirut, 27 March 2015. Jameson, Valences of the Dialectic (London: Verso, 2009), p. 598. Zizek, The Puppet and the Dwarf, p. 164. Fredric Jameson, Valences of the Dialectic, p .612.